This study aims to evaluate the relevance and adequacy of immersive media technology such as virtual reality (VR) and 360-degree panorama as forms of representation of the lighted environment. This experiment compares perception of light and space in physical reality versus perception in virtual reality. The experiment was conducted in a representative classroom with two twelve-foot long direct-indirect distribution luminaires. Each luminaire could dim and adjust color temperature of the direct and indirect components separately. 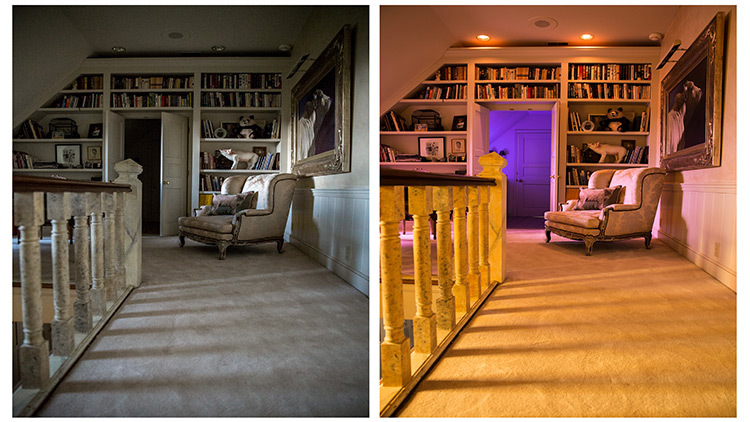 Three variations in illuminance (25, 50, and 75 foot-candles) and three color temperatures (2,700, 4,000, and 6,500 K) were used in the study, with a balanced distribution of the uplight and downlight components and relative uniformity throughout the space. Representations of the room were created directly in the VR system and through AGi32 simulations knitted together in the 360-degree panorama for this three-part comparative study. Subjects were asked to provide their evaluations for each environment (physical, VR, 360 degree) using a series of semantic differential scales that could be quantified. The analysis of the results suggests that VR and 360-degree panoramas are not perfectly suitable for lighting representation and are adequate only for specific applications in its current state of technology. This highlights the notion that stakeholders must be continuously critical of technology being introduced into their practices. The recommendations formed in this study could affect how immersive technology is developed and used in the future.